When it comes to eating out, my husband and I usually try a variety of restaurants around San Francisco or San Mateo. But of course we can’t go out to eat all the time since we have a 4 year old who only likes pizza! So we improvise. What I like to do is get inspiration from the place’s we’ve eaten and try to make my own simpler version of it for us to enjoy at home. I teamed up with Grocery Outlet Bargain Market to bring you this post inspired by our recent restaurant adventures! I made two San Francisco restaurant inspired dishes with fresh organic ingredients from our local Grocery Outlet. Why Grocery Outlet Bargain Market? 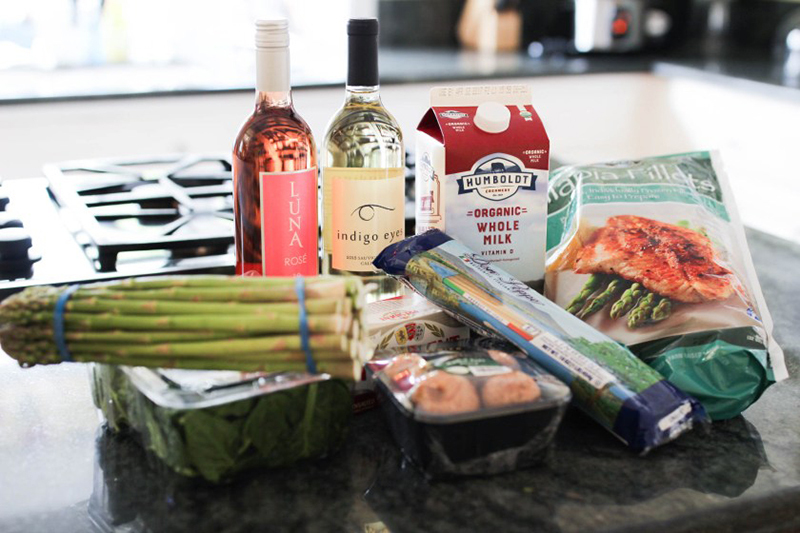 Grocery Outlet actually has amazing deals on wine and food, but it is not just the price that matters- it’s what you do with it! So that is why I wanted to show how you can live like a San Franciscan and dine at your hearts content, whether it’s by yourself, a date night or with kids! AND not break your wallet or have to travel all the way to the city to enjoy. It’s a balance after all! Every time you eat out, take note of the dish. You take photos anyways! Try to remember the ingredients you saw, smell and tasted. What kind of wine did you pair it with? The other day we tried a popular and historic restaurant called Per Diem located in the Financial District of San Francisco. 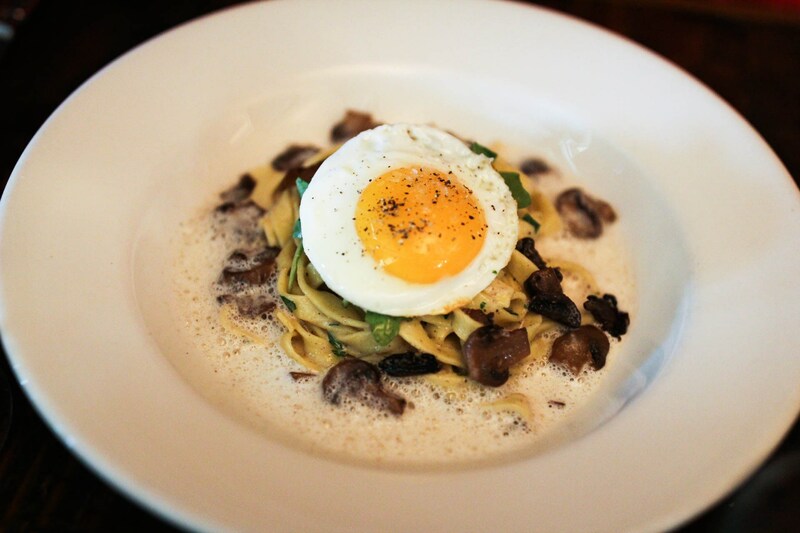 I ordered the Wild Mushroom Pasta (house made tagliatelle, wild mushrooms, cage fee chicken egg, tarragon truffle sauce) $19.00 and my husband ordered the Mussels & Fries (PEI mussels, garlic & white wine sauce served fries and garlic aioli) $19.00. They were both so delicious. So I wanted to recreate the Wild Mushroom Pasta dish. Another night I ate at the beautiful Boulettes Larder located in the San Francisco Ferry Building and had the Northern Halibut $32.00 (Roasted in the wood oven, asparagus, spinach, asparagus cream) and it was exquisite. So I thought I’d take a shot at that as well! Aim high, but be realistic about your budget and time! So I decided to do my shopping at Grocery Outlet, a discount grocery store, because I heard they now offer a NOSH section, that offered organic selections and a huge wine selection. I know how much my Bay Area friends love their organic ingredients, and even Grocery Outlet has that covered! I didn’t have an extensive ingredient list obviously, but I kind of guessed what might work for the recipe. If I had more time, I would have worked of the ingredients listed from the menu, but this was a little last minute so I just looked for some basic items that I could substitute for the actual dish. The total amount I paid, including 2 bottles of wine and organic vegetables for all my dishes, was $29.48. I added some ingredients I already had at home like, eggs, garlic, olive oil, asian bak choi (I used up all my spinach for one dish), salt and pepper. Improvise and Have Fun Cooking!